Plants in Our World 4 Edition This one-semester text is designed for an upper level botany course. 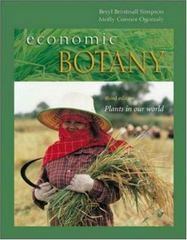 Plants in our Society emphasizes how people use plants; including fundamental information on morphology, anatomy, and taxonomy as a foundation of general botany. Now in full color, the fourth edition includes molecular data that has immensely altered the understanding of relationships among flowering plants and recently pinpointed the origin of numerous crops. Taxonomy of species has been updated to discuss the system of the Angiosperm Phylogeny Group.